Spend an evening making 5 notecards and a co-ordinating box using the BRAND NEW Washi Tape Basics Pack 1 from Stampin’ Up! 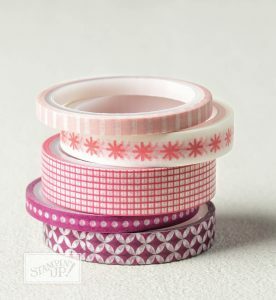 PLUS Washi Tape Basics Pack 1* worth £7.25 to use at class and take home with you. * Washi Tape Basics Pack 1 – 5 rolls 4.8mm, 1cm, 1.3cm widths. 4.6m of each design.